It’s days like today that make me think this trip wasn’t a bad idea. It was a very good day. The wind was light, so not really a factor, and the whole day was spent on back roads with light traffic. Rolling hills and some real hills, but OK.
We left Savannah and immediately crossed the Tennessee River going west (big road, but huge shoulder, and turned off soon after), then followed it all day. Tomorrow morning we will begin by immediately crossing it again, going east, and will continue to follow it on that side. After passing over the river today we passed through a completely flat area, obviously in the river flood plain. It was obvious from the mud residue on the bushes that the water had recently been four or five feet above the road level. I guess it was when Nashville flooded a couple of weeks ago. Riding along there, it was hard to imagine. You would think following a river would be flat, but not so. Tomorrow we do what Anne Patterson called the Tennessee Tetons. We’ve been avoiding the hill profiles that you can look at on the Adventure Cycling maps so you can see how hilly your day will be. We agreed we just didn’t want to know. But I did sneak a peek to see what these will be like. The good news is we should be over them in the morning. The theme of the day seemed to be dogs. We were chased by more dogs today than we’ve seen the whole trip. One lady had more dogs than we’ve seen the whole trip! Again, they were mostly interested in us, rather than vicious, but there were a lot of them! One of them really gave Tom, out ahead of me, a run for his money. I stood up and poured on whatever speed I had, so by the time the dog saw me I had some momentum. It worked, but I paid for that all-out spurt of speed later in the day. The picture today doesn’t look like much, but maybe I can bring it to life for you. We stopped for lunch outside Decaturville TN at a place called Susie Pat’s or something similar. Great food – Tom pronounced it the best cheeseburger he’d had in a long time – and very inexpensive. We stayed to rest, review maps, and make reservations for Sunday night. After lunch we passed through town, almost a ghost town like so many small town squares, and heard this music, which I can only say sounded like something out if the movie “Oh Brother Where Art Thou?”. 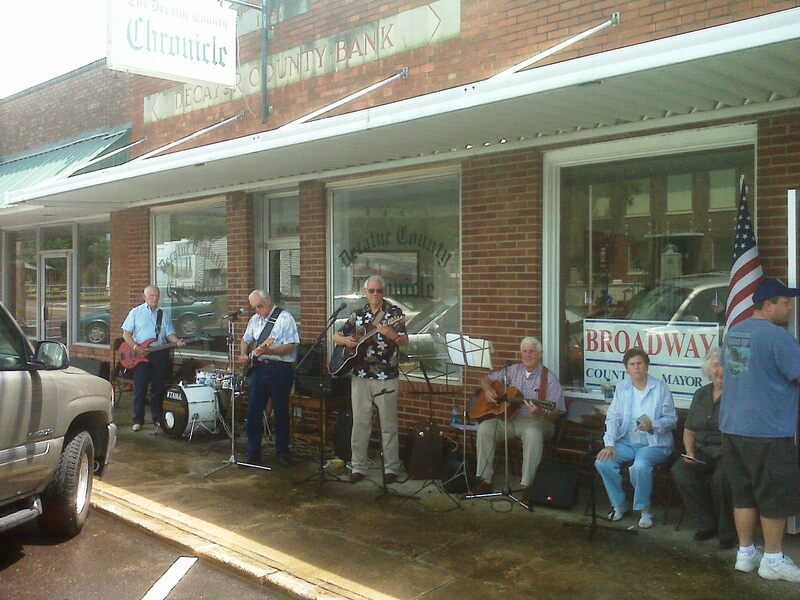 These were all men in their seventies playing music for a get-together in front of the campaign headquarters for a candidate for Decatur County mayor. I never heard of a county mayor. Anyway, I couldn’t stand it, had to stop and take their picture. The candidate came to shake my hand, (yuck, dirty cycling gloves! ), they all offered us water, and they were as nice as could be. We went on our way, and for the next couple of miles I could hear Tom back there wailing a country tune of his own making. He doesn’t sing much, but he can carry a tune. Cracked me up. I’m afraid the picture doesn’t do justice to the experience. I really need to finish up. I’m actually writing this on Sunday morning, and we need to get going. Wanted to mention weather. There have been lots of thunderstorms all around us but so far we’ve been very lucky. They mostly build up from the day’s heat and come through in the afternoon and evening. We had a huge thunderstorm here last night and lost power for a couple of hours. They are talking about rain around today with flash flood warnings through the Tennessee Valley, so we will watch very carefully. Destination for tonight is Waverly TN. This was a tough 63 miles, by far the hilliest day we’ve had. We climbed 3000 feet according to the GPS. I’m not afraid to admit I walked the top half of a couple of the hills-I’m way past caring about anything but getting to the top, and while my legs are OK, my lungs just tell me it’s time to get off. The trick is getting off while you still can, without falling over. Tom toughed it out on all the hills-he says he’s surprised at how much better he feels on hills than he used to. His shoulders are both feeling worn out, but we think that’s just part of the general fatigue from the day. We’re both very tired. I don’t want you to think the climbing we did today was that much-it was just a lot for us. People cycle in the Rockies and the Appalachian Mountains all the time, and I’m sure they climb much more than this. I’m just glad we chose the (very) long roundabout route instead of going through the Smokey Moutains. The route today was, once again, completely on very peaceful back roads. The whole day was beautiful. We started out in a steady rain, but it soon let up. It was stormy looking all day, but only sprinkled off and on. The picture is from the very beginning of the day, when we were crossing the Tennessee River. It really doesn’t capture the mysterious feeling that comes with being out in the rain, nor the wisps of steam coming off of the river and the trees. We met a lot of nice people today, having a friendly conversation at each break we took at a gas station/convenience store. Most of those kind of stores at crossroads seem to double as a center for social interaction, and they have a few tables where you can order food and where the locals gather. We had an excellent lunch at one of them today. We have run into another cyclist, the first we’ve seen, which kind of surprises me. we heard he was out ahead of us, as he had stopped for a break at the same store we did. We never expected to see him, as we are not fast enough to overtake anybody. He is staying here in Waverly though, at the same (and only) motel. He has been on the road one day longer than us, came from Jacksonville FL, is headed to Akron,Ohio to spend two weeks with a grown daughter he hasn’t seen since she was three, and then intends to go on to the west coast by way of the Adventure Cycling. Northern tier route. He’ll be on the road six months and says this a dream he’s had since he was fifteen. He’s 53 years old. People are so endlessly interesting! The other two things of note are animal sightings. We finally saw some deer today. 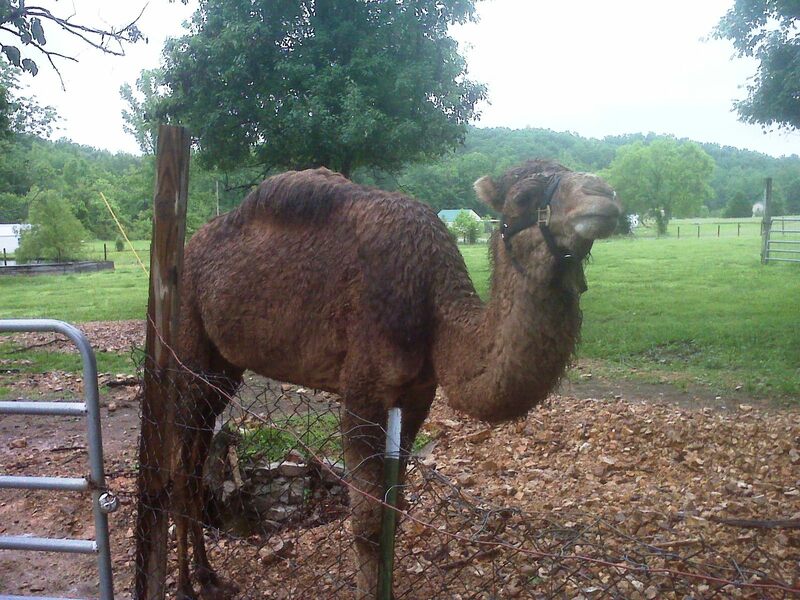 And we saw a camel (yes, a camel), a buffalo, and an elk in a yard, being fed. Have pictures to prove it. Today was a great day, to me, near perfect. Tom balks when I say that, because it was very hilly again today. But he enjoyed himself, too. We climbed 2600 feet in the 46 miles we traveled, but it was all long, slow climbs, where you could find a gear and just chug along slowly until you reached the top, then enjoy the long downhill. Nothing frantic requiring the lowest gear and making you feel like your lungs were going to explode, like yesterday. Anyway, the temperature was almost perfect, winds weren’t much of a factor, road surfaces were good, and there were almost no cars, all day. 46 miles of picturesque back roads. The wind came up from the west at the end of the day and we came into town on a strong tailwind and a long downhill, on a smooth highway with a shoulder as wide as a full lane. We bought a six pack of adult beverage, sat on the little porch of our motel room facing the archway made of elk antlers, and ordered a pizza. I’m telling you, it was a great day. As Jamie Claar used to say to us, it just doesn’t get any better than this. The picture embodies the feeling of the day, just green and peaceful. 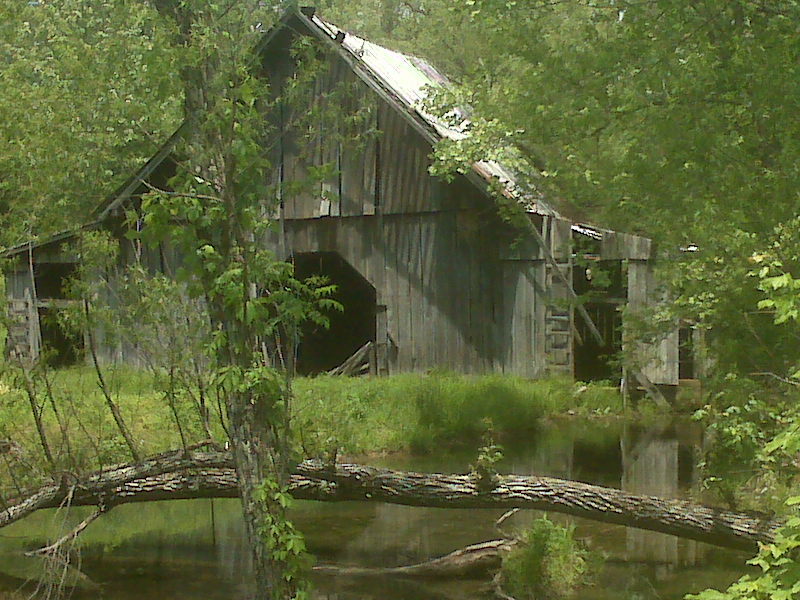 This old barn is actually partly submerged in the pond. I don’t know if that’s because of the recent flooding. We’ve seen lots of evidence of recent high water and washed out roads. Two weeks ago we could not have traveled these roads. We met an older couple named Lurlean and Harry when we took a break this morning at a bridge over a very wide, pretty stream. We’ve noticed the creeks here are unusually clear, and actually a clear aqua color in the deep areas. Not Torch Lake blue, but very pretty and not what we usually associate with southern creeks and rivers. Anyway, they just saw us there and stopped their truck in the middle of the road to visit for a few minutes. They asked about our trip, told us about their house on the river, we petted their little dog, and off they went. She was obviously a talker, and recognized a kindred spirit. The downside of such a rural route is you never know when you will come to a store or restaurant. Today’s “lunch” stop was a bare bones convenience store combined with a bare bones bar, unbelievably smoky. For one o’clock on a Monday there were a surprising number of good old country boys there drinking beer and carrying on. But the lady behind the counter was very nice, and as we ate our lunch outside, several of the men came out, individually, to exchange pleasantries with us. One of them, a trucker, talked to us about our route and made a great suggestion that enabled us to bypass a hill. What seemed like a dicey proposition when we pulled up, but the only option for ten miles, turned out fine. For two days now we have seen lots of very pretty lavendar moths along the route. They are just above the road surface, small and delicate, in great numbers. I find them sort of magical. It must be time for me to get some rest. Tomorrow we travel through an area called Land Between The Lakes, a 50 mile long area (10 miles across?) 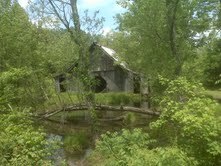 bordered by Kentucky Lake (part of the Tennessee River) on the west and Barkley Lake (part of the Cumberland River) on the east. I was fascinated when I first saw it on the map, and excited when I discovered the route would take us through it. I hope I’m not disappointed. We will pass into Kentucky sometime in the late morning. I am overwhelmed with the feedback I got about yesterday’s picture. Now I feel like every picture has to measure up, and it just can’t be so. These pictures are coming off of my phone, I’m a lousy photographer, and that one was just a fortunate accident. 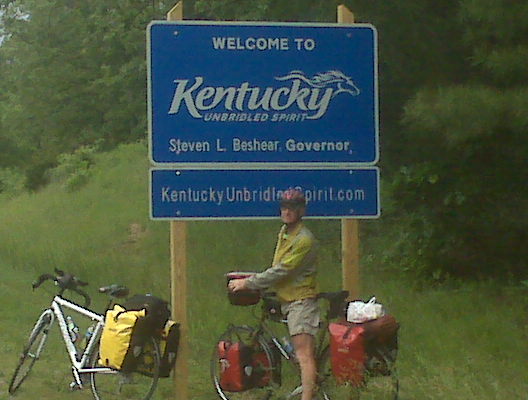 Having said that, today’s picture is, obviously, Tom standing in front of the welcome sign for the state of Kentucky. YAY! We’re in Kentucky!!! Tennessee was great and I kind of hated to leave it, but this is evidence of forward progress! As a bonus, or an exercise in redundance, depending on how you look at it, I am including the version of yesterday’s picture that I meant to send, the “un-zoomed” version. I think it’s better. Land Between the Lakes (or LTL as the locals call it) did not disappoint, but was not a spectacular, life-altering experience for us. It is a National Recreation Area, federal land administered by the National Forest Service. There are many separate areas designated for different purposes along its length and on both sides-camping, fishing, hunting, horseback riding, boat launching, group camping, a planetarium, a bison range, and an elk and bison prairie. I am not a good tourist and hate sightseeing, but I wanted to ride through the elk and bison prairie. Then I thought about it and realized that wouldn’t work. A fenced area, certainly, with elk and bison roaming free, and people driving through. Only we wouldn’t be driving through, and we wouldn’t be inside a car. Sure enough, I asked at the visitor’s center, and no bicycles and motorcycles allowed. Maybe next time. There is only one road traversing the length of this area, so we rode all day without making a turn or worrying about following a map. That had its own advantages, and was very different from yesterday, when we might turn every two miles and had to watch the map carefully. The first half of the day was hilly like yesterday, then the route evened out to smaller rolling hills. Traffic was very light. A mild headwind, but overall a very manageable day. We climbed 2300 or so feet. We stopped for lunch at a picnic table near the Visitor’s Center and planetarium. One thing you need to know if you ever come here is that you must bring in any food, drink, or other supplies you will need. There is no store or gas station anywhere. Fortunately we figured that out yesterday (always with an eye to where our next meal will come from). We picked up lunch at the BP station in Dover and brought it in with us. Tom had a sandwich and chips and I had what has become my standard roadside lunch, cheddar cheese and saltine crackers, with a V-8 juice chaser. Shortly after lunch we saw a cyclist far behind us, probably a mile. He didn’t seem to be gaining on us, which is a first in my experience. (Have I mentioned we are really slow?) About 12 miles later we took a break, and he pedalled by us and stopped to visit. He was from Illinois, staying at a motel about a 30 minute drive from the north welcome center, and taking a day ride, with a Burley brand trailer with his little dog perched safely atop it, harnessed securely, in a half-crate. We had a nice visit, and parted ways. We are staying in the very small town of Grand Rivers, for two nights, as we are taking tomorrow off. You are probably saying to yourself, “Didn’t they just take a day off?” It almost seems that way to us. The last four days have passed very quickly. But our various parts and pieces need some down time, so here we are in Grand Rivers. It has been a nice, relaxing day. Breakfast out, grocery store run, laundry while we sat around the pool a while, lunch out, sat around the pool some more, had a snack, Tom worked on the bikes a little, still sitting around the pool, just waiting for dinnertime. I’m starting to see a theme emerge and it’s no wonder we haven’t lost any weight! 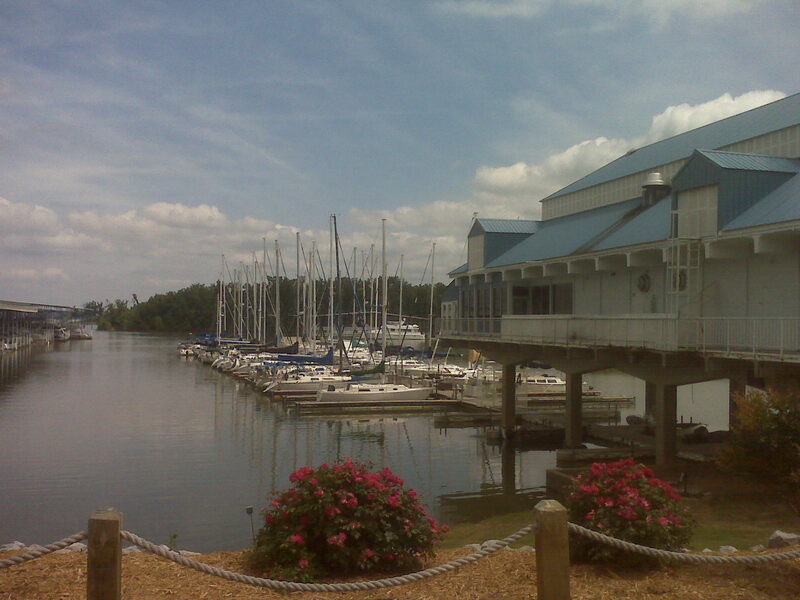 The picture is from lunch at a marina development called Green Turtle Bay on the Barkley Lake side of things. Good burger and club sandwich at the waterfront joint. A beautiful development with cottages, condos, and hundreds of boat slips, all full. What you’re seeing here is the yacht club building and a fraction of the sailboats, and the other picture shows just a few of the hundreds of huge ocean-going yachts in their slips. 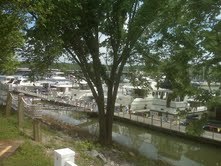 Not much going on there today, but billions of dollars in yachts, from all over the country. It is possible to navigate north from here to Lake Michigan, and through the St. Lawrence Seaway to the Atlantic, or south through the Tennessee River, the Tenn-Tom waterway, and the Tombigbee River, into the Gulf. Grand Rivers has been a good place for an off day. It is a tiny town, about a dozen businesses, but obviously benefits from its placement so close to so much water. It is actually a low-key resort town. There are outdoor outfitters, and. a couple businesses catering to the motorcycle riders who frequent Land Between the Lakes (it appears there is no helmet law in Kentucky). There is an extensive complex called Miss Patti’s 1880’s Settlement, which has in fact been here since the 1980’s, is family owned, and has grown over the years to include miniature golf, a selection of gift shops, a wedding chapel and pavilion, and an RC boat pond, in addition to a sprawling restaurant with Victorian-themed decor. Sort of Brownwood Acres meets Dollywood. It’s THE place in town for dinner, so we made tonight’s 7:00 dinner reservation as we were leaving last night! So many of you have written to tell me that someplace we have been has a part in your history. Honeymoon spot, mother’s vacation spot, relatives lived/worked there, or it just makes you homesick for the south. We enjoy hearing all of those stories- I wish I could respond to all of them. This typing on the phone is kind of hard on my thimbs, and time-consuming. But I wanted you to know that those messages just make us feel more of a part of the fabric of…well, of something. So there you are. I’m threatening to make Tom write the update one night, but I’m not sure that will happen. As to other equipment/apparel, we are very different. I wear cycling shorts, initially years ago for the padding, but I confess I find them very comfortable. I will only ride in a shirt or jacket that is a very visible red, orange, yellow… I’m prone to nerve compression issues in my hands and can’t ride without cycling gloves, which are padded in the palm. After riding for thirty years in uncleated shoes and cage type toe clips, I made the transition about four years ago to cleated, clip-in shoes, and I wonder how I ever rode without them. Tom rides in regular shorts, no pad, sneakers or Tevas with cage toe clips, and no gloves. I’ve had to insist that he wear bright colors for visibility. He’s always been kind of a non-conformist. OK, I’m walking around in lycra and spandex and calling Tom a non-conformist. Forgot to mention that we acquired a mascot yesterday morning. Shrek movies have always been a favorite in our family, particularly certain characters. McDonalds happy meals right now come with one of the Shrek characters, and we were able to get Tom’s first choice, the Gingerbread Man. (“Oh, No!! Not my button! Anything but the button!”) He rides in Tom’s map case. Unfortunately he is stuck looking at the sky all the time. A couple of observations on our northward progression. I think we may have seen our last (dead) armadillo. They are southern creatures, and I had wondered when we might outrun them. We have seen them regularly as road kill, but none yesterday. I’ll get back to you on that. Not to be confused with armadilloes, we have probably seen the last of sweet tea (except at McDonalds, which serves it everywhere and doesn’t count). Our experience from many years traveling to Michigan from Georgia is that they don’t usually do sweet tea in Kentucky, and certainly not north of there. Northerners just don’t get it. If you ask them for sweet tea they’ll tell you there’s sugar on the table, acting as if you have half a brain. When anyone WITH half a brain knows sugar doesn’t dissolve in cold tea. Don’t even get me started. It’s obviously time for me to turn the light off and get some sleep. Tomorrow’s goal is Cave-in Rock, Kentucky. For real! We have reached the halfway point in our trip! According to my projections, this trip was going to take 32 days of riding (plus off days), and would be about 1600 miles. We have now ridden for 16 days, 848 miles, and we are exactly where I thought we’d be after 16 days of riding. So I’m calling it halfway! Part of me thinks wow, that’s great (and it is great), but part of me can’t believe that after such a long time on the road, we’re only halfway. Haven’t we been out here for six months already? Both of us feel that the days are passing faster and faster. The list of places we’ve been grows longer and each day is a smaller piece of that. It doesn’t hurt that the last week has gone so smoothly and the days have been so enjoyable. Anyway, looking ahead to the next half of the trip, it seems that we’ll be making consistent progress, always heading north. We are finally out of the south-not that I don’t like the south, I love it. We were just there for a very long time, and because of our initial roundabout route, we didn’t seem to be getting much further from home. We would ride for 10 days and then see a sign for Nashville, which is only a 4 hour drive from our house. Now we’re seeing signs for places far from home, like Paducah, Kentucky, and Marion, Illinois. Speaking of which, you may have noticed that we are in Illinois! We are staying in a “lodge” room (actually kind of half a cabin) at Cave-in Rock State Park, across the Ohio River from Kentucky. Our ride doesn’t actually take us into Illinois except that we chose to stay here tonight (since there isn’t anyplace else on the route for 30 miles). We came over on the ferry, which is free, and runs from the town of Cave-in Rock, Illinois, population 350,to what appears to be nowhere, Kentucky, just a ferry landing. Our room sits on a bluff over the river and has a great view both across the river, and of the several commercial barges that have gone up and down the river since we arrived. The cruel surprise was the hill we had to climb coming into the park, to get to the top of that bluff. It was much worse than anything we had done all day, and came at a time when we were tired and thought we were all but done! I thought there must have been a cave-in at some point in this area. Turns out there is a cave in the rock, which you can visit. I don’t think we’ll take the time. Today’s pictures are of the ferry, and of a particular barge that passed our lunch spot as we were leaving, then passed here 3 hours later after we rode north, crossed on the ferry, and checked into our room. The clear message here is that we were faster than the very slow barge. We rode in steady rain for about two hours, then it tapered off and didn’t start up again until we were on the ferry hours later. Never any bad thunder and lightning. Of course we were soaked through, which is fine while you’re riding but chilling when you stop and cool off. We took very short breaks to keep from cooling off, just long enough to turn the map, eat a banana… Finally at 40 miles we took a real lunch break and ate food from our packs, sitting in front of the Community Center building in Carrsville, Kentucky. As far as we could tell, Carrsville had some houses, some unoccupied, and a nice community center, period. That was typical of the day-we went 50 miles today without passing a single store or gas station. That goes along with traffic-free roads, though, so it’s a good thing. 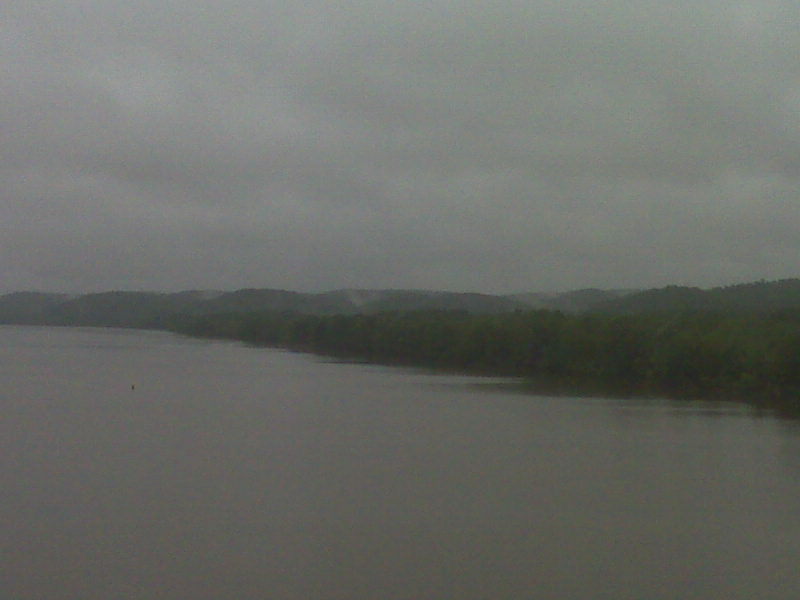 We left the Tennessee River today – it went off somewhere, and I’m ashamed I don’t know where. 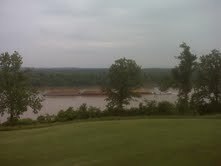 Instead we have picked up the Ohio River, which we will follow for three days total. Henderson is a busy town with terrible traffic, and it was nerve-wracking coming into town the last few miles, but we’re checked into our Sleep Inn and waiting for a table at a steak house down the road. Half price on draft beer (can I say that on a G-rated list? ), and life is good. We started the day on the ferry back to Kentucky, and the ferry driver displayed his finesse in making a perfect landing, allowing for the river current. He’s been doing that job for 31 years. 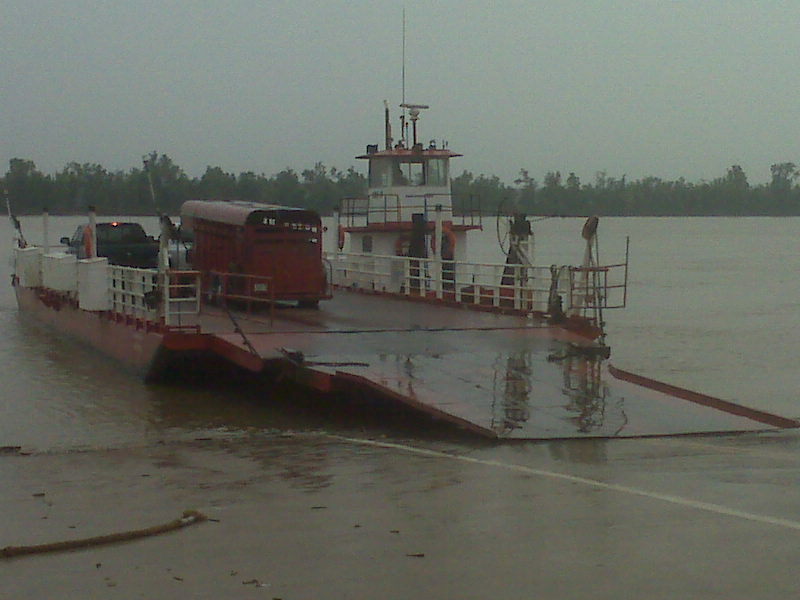 We had heard that the ferry doesn’t run if the wind is heavy from a certain direction. We asked, and he said if it comes too strong upstream (from the west at that curve in the river), the waves are too high. He also told us there were two cyclists who had come across the river two trips ahead of us. We were sure we’d never see them, as we never overtake anybody. But as we pulled into the town of Sturgis 15 miles later, to the first convenience store we’d seen in over 60 miles, they were just pulling out. We cyclists are hard to miss, in our geeky helmets, obnoxious bright colored clothes, and embarrassingly tight shorts (except for Tom, of course). We greeted each other like long lost friends, although we’d never met, and started comparing notes about our experiences. Named Steve and Carol, they are riding a tandem and pulling a heavily loaded trailer. They are from upstate New York, and doing the entire Underground Railroad route from Mobile, Alabama to wherever in Ontario it ends, north of Niagara Falls. Then they will ride the 450 miles back to their house. Now comes the part that makes us look like slackers. They started on May 9th and have been doing 70 to 90 miles a day without a single day off. We talked for a while, discovered we were all planning to stay in Henderson tonight, and exchanged phone numbers with the intention of getting together for dinner. Off they went, an hour ahead of us and much faster than we are by virtue of being on a tandem and because I think they are just much tougher than we are. They ended up at a B and B in town, and by the time we got that message, we were checked into the Sleep Inn several miles away. That’s a deal-breaker when you’re on foot, so we may try to meet up tomorrow night in Owensboro. As an aside, we discovered that Steve and Tom share the same birthday, May 24th. We look forward to meeting up with them and hearing about their adventures. Shortly after leaving the ferry today we passed the sign in the picture I am sending. 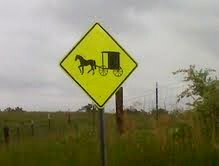 Apparently there is an Amish community in that very localized area. You’ll have to imagine the picture I couldn’t take. We passed a house with laundry hanging out to dry, and the sheer numbers and array of blues, purple blues, and green blues were just lovely. I realized this was laundry from an Amish household, and the image of that simple, monochromatic yet colorful collection of clothes just would not leave me. I had to go back. I know most of the Amish don’t like to be photographed, and I didn’t want to offend anybody. When we rode back (not far), the lady of the house was out working on the laundry line, so the photo was not meant to be. We lurked around the corner behind the hedge for a minute, but moved on without the picture. You’ll have to see it in your mind’s eye – either the beautiful picture, or us lurking. You pick. We are exhausted tonight. Yesterday was very hilly and the first half of today was as well. There was one more lung-buster and I walked part of it but Tom hung in there. The rest of them were manageable. The second picture is of Tom ahead of me on a particularly rural road called Cotton Patch Road. This was shortly before we descended down through Pig Pen Hollow. Honest-those are the names in the Kentucky state atlas. The afternoon levelled out to rolling hills and flat. The winds were either crosswinds or at our back, and became very strong late in the day. Again, we were blessed with a strong tailwind at the end, when we were tired and needed it most. We also dodged the storms again. Stormy skies all morning, but only a few fat drops on us after lunch (picnic lunch in the town park of Morganfield). Skies cleared some and we had sun, but heard of storms and big hail in surrounding areas. A quick word about the changes we’re seeing. Definitely no more armadilloes. Starting to see lots of young fields of corn, about a foot high. Saw our first trademark blue Harvestore silo today. We’ve seen a number of healthy looking blue spruce trees in yards, and they will not grow well in the hot south-we know, we’ve tried. We even saw a couple of white birch trees today. Definitely more working farms. Is the honeysuckle still in bloom in Georgia? The roadsides have been lined with masses of honeysuckle our entire trip. The sweet smell accompanies us on every rural road. I don’t know if we are just following its blooming cycle, or if it blooms for weeks! Hi, Joanne, Tom! I think the Day 17 post just added here is the best one you’ve done so far. I love the barn photo–and the magical lavendar butterflies!